Not really enough detail here - can you post a close up of leaves and give a description please? My best guess at the mo would be Bay or Eleagnus or Camellia??? Does it flower? 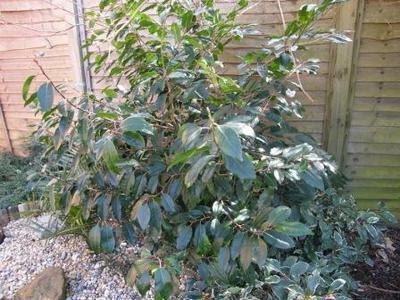 i think its an Eleagnus, but a good indication of this would be Eleagnus have a silver underside to the leaf.